Like the old Chicago song says, "Does Anybody Really Know What Time It Is?" Well, yes!! And does anybody really care? Well, yes again!!! Imagine having no sense of the day, date, time, month or even year. After struggling with all kinds of clocks and calendars, I decided to make one more attempt at helping to orient my mom with her sense of time. I found this little beauty (shown below) on Amazon.com and decided this would be my one last effort to help my mom hold on to her sense of time. 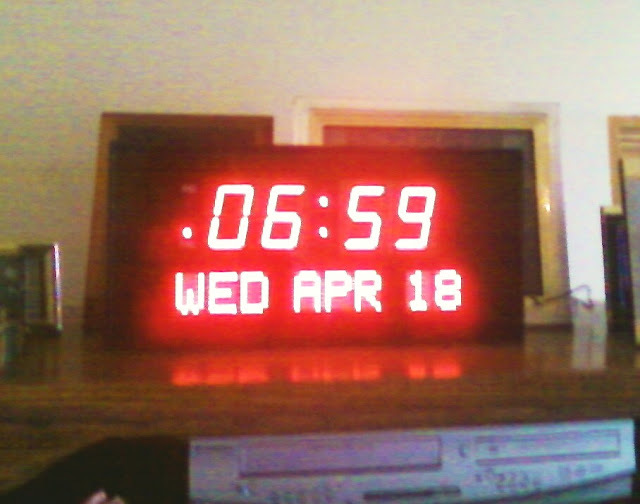 As you can see, this is a large electric clock, which illuminates quite brightly. No glasses or lights on necessary. Now, instead of frequent phone calls to ask the day, date, time or month, I am getting frequent calls thanking me for the clock. My mom loves it and even said sometimes she just lays on the couch and stares at it!! Ha!! She probably does. Previously, her friend, Sue, had loaned us a "day clock". That worked for awhile, but my mom would "forget" to refer to it on the wall. A few years ago, she had also used her cell phone for awhile, but that was an expensive way to keep track of the date and time and often would get "misplaced". Maybe now she will not say she is going to watch "Saturday Night Live" every night. I'm not sure she really stays up that late, but she likes to talk about it. The bottom line is that this is helping her feel more in control and that is a good thing. I teased my mom that now people will be calling her to ask what time it is!! I hope she will be able to use this for awhile, but the reality is this could also become confusing at some point. In the meantime, the happiness it has brought is already worth it!!! Read the Book, Saw the Movie! I like to think I am on the "cutting edge" of some things. New products, trends, new restaurants, a new app. 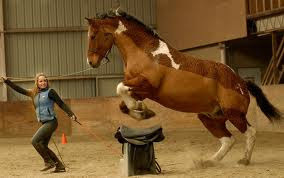 However, this post is not about one of them!!!! 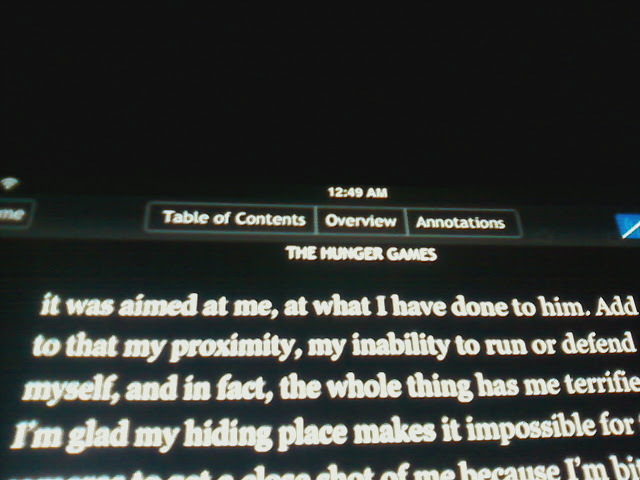 A few weeks ago I had no intention of reading Hunger Games or seeing the movie. I didn't pay much attention to anything about it. The only thing I did know was that the book was required summer reading for my daughter and all freshmen entering high school last fall in our school district. Automatically, I thought that meant it was another teeny bopper book, much like the Twilight series and although I know many "moms" got into those books. I was not one of them. However, after my daughter saw the movie the first weekend it was out and then hearing from some fellow bloggers and others that had also read the book, my curiosity was peaked. Maybe there is more to this book, so I decided to make a go of reading it. I also thought it would be another way to connect with my daughter, Megan. As a stroke of luck, the Hunger Games trilogy was available for Nook download via the www.hip2save.com website for $5 (and some change) for all three books. I had noooo idea really what the book was about, but I have to admit that when I found out Liam Hemsworth was in the movie it was an added incentive (I don't know why, because I could be his Grandma -- ha!). Although I found it difficult to read more than a chapter at a time due to distractions around the house and having 3 kids home for Spring Break, I did manage to finish the book in 2 weeks thanks to some late night reading. The book was excellent! Loved it!! It should also be noted that if anyone had explained the premise of the book or movie to me, I would have said "not my kind of thing" -- and yet, it was! When Megan learned I was reading it, she made me "pinky promise" to bring her along when I went to see the movie. So, on a recent Saturday morning ($4 show 'cause I'm "thrifty" like that), we all went to the theatre. My younger two kids saw the "Three Stooges" and me, my husband and Megan saw Hunger Games. What a difference two weeks makes. 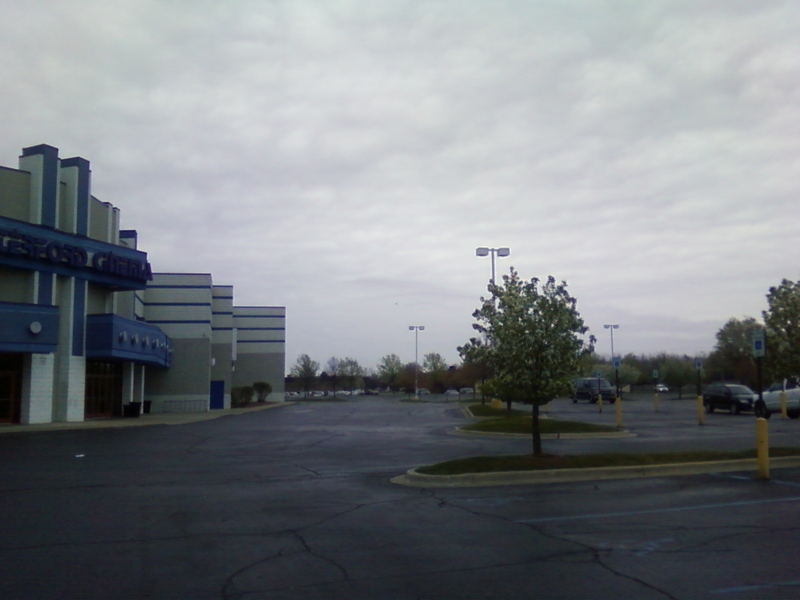 I laughed that the theatre parking lot was virtually empty as most people had probably already seen the movie!! I liked the movie very much, but I loved the details in the book. Even though the movie is over two hours long, the storyline goes much faster than it does with all of the details in the book. I don't think I've ever read a book after a movie came out and then made it to the movie during it's first run. In the end, I am glad I did! It also made for lots of conversation for me and Megan...especially when we explained to my husband what was left out of the movie. For the record, he enjoyed the movie without reading the book. So, there you have it. I have moved on to the second book in the trilogy, "Catching Fire". Since that movie has not even been cast yet, it appears I have lots of time to read this one!! 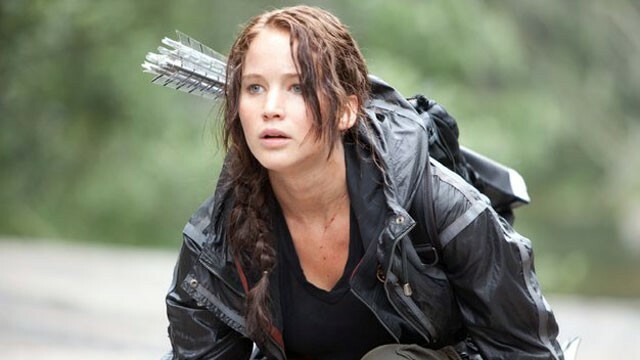 There's still time to jump on the Hunger Games band wagon!! Have you read the book or seen the movie? What did you think? Avoid the rush...see a movie two weeks after it comes out! Early this morning I received double good news from two very special people in my world!! My cousin (and godchild) Jennifer and my bff Nancy's daughter, Sarah, who is also my godchild. 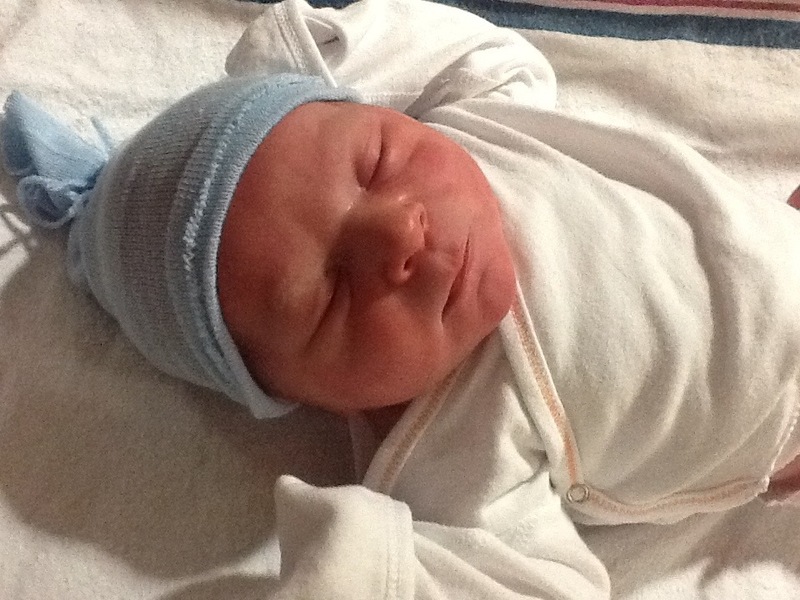 Both mommys had baby boys early this morning!! This has just rocked my little world...what are the chances?? 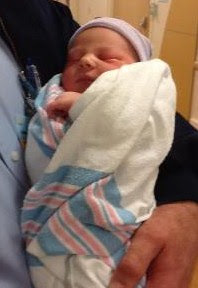 It has also been suggested that this makes be a godgrandma (Brian), but that makes me sound really old! Ha! Awwwwww, how cute are they!! I am so happy for their parents and families!!! With all of the nice weather we have been having, of course the kids have been outside more. Over the weekend, Jacob asked Kristin to play catch with him. Kristin does not even have a baseball mitt, but Jacob took care of that and they went outside. My husband and I happened to be in the living room and my husband saw the ball hit my car.... You know where this is going, right? 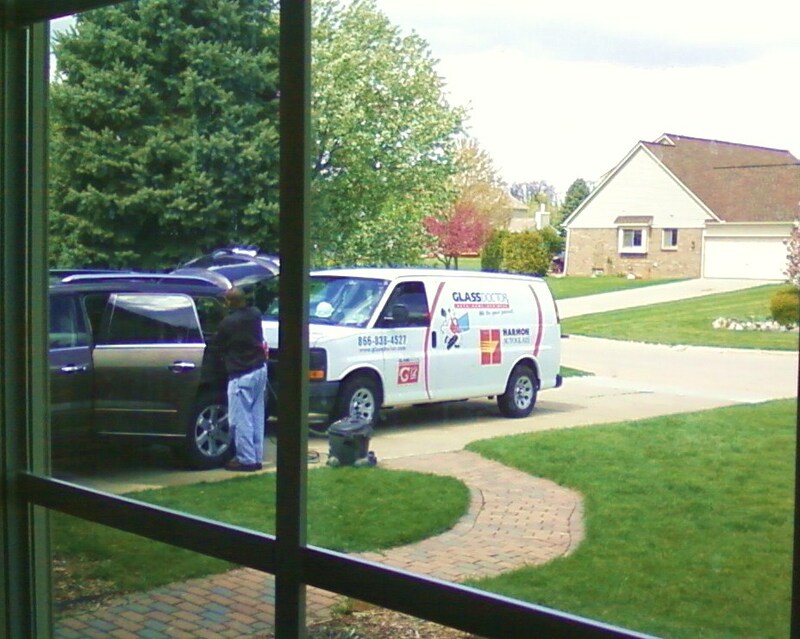 Did I mention I rarely park in the driveway, they rarely play catch, and they rarely play in the front yard. 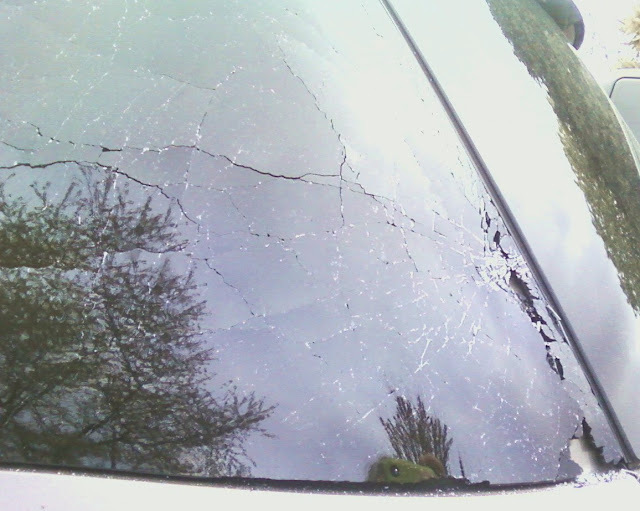 I was expecting a dent in my car. I saw Kristin walk by the window with a shocked look on her face...and then we all saw this! We have a little tax day tradition that somehow got started here several years ago and it goes something like this. Husband buys Turbo Tax from Costco (the only store he "shops") at the end of every year as soon as it comes out. April arrives. Turbo Tax has not been seen and taxes are not done. 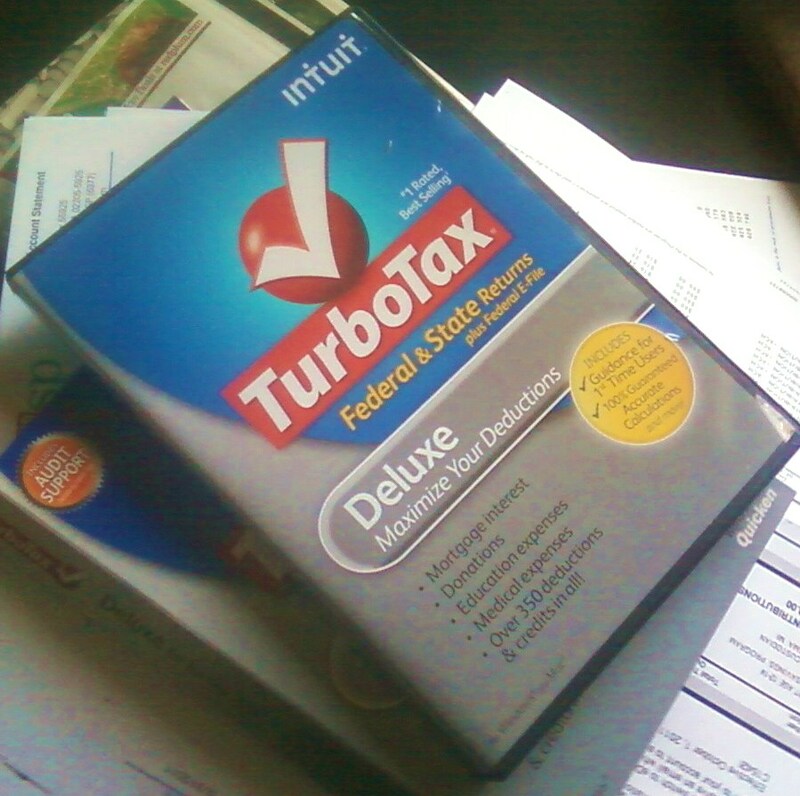 Two to four days before taxes are due husband looks for "misplaced" Turbo Tax. Husband sends wife and kids into a frenzy looking for Turbo Tax. Wife tells husband it is probably in one of his dresser drawers. Husband denies but eventually finds said tax program in his dresser. The living room becomes the office of my crazy accountant/husband. The world is put on temporary hold. The tension in the house is palpable. The envelopes and paperwork are everywhere. There are coffee mugs scattered about. There are hours of silence and darkness. And then, through the magic of electronics, it is announced through the darkness that our State and Federal taxes have been filed!! The wife is expected to rejoice in happiness, but secretly wonders why he waits!! The husband confidently walks away from said scattered paperwork feeling very accomplished and smug about his ability to work under deadlines and pressure. The frenzied paperwork may or may not be picked up between now and.... April 2013!! Here's hoping we come up with a better plan by next year!! Hope things went better for you!! Ha!! Happy Tax Day!!! No news...is good news!! The truth is, I have not been to see my mom since Easter last week. Things have been busy around here with the kids. 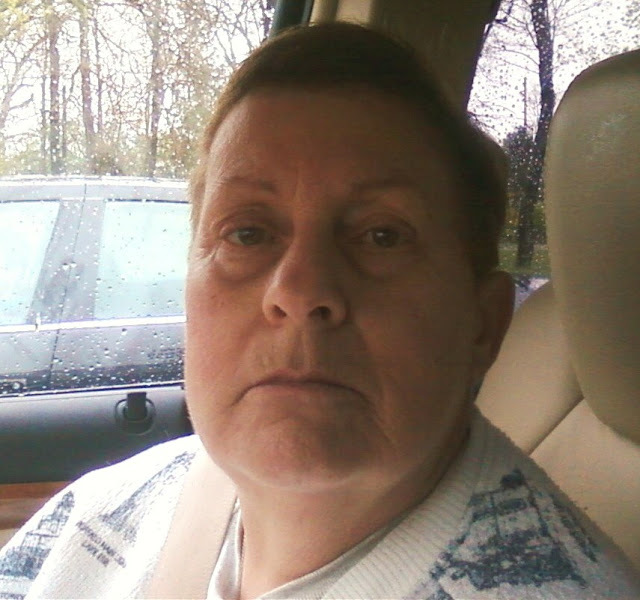 I have also been managing my mom's bills and getting her paperwork in order for her income tax return to be filed. In addition, I have some forms and paperwork to get in order for the low incoming housing program. my mom is a part of. I think I have admitted this before, but sometimes I feel like when I call or visit my mom in "her world" it is like stirring a pot that doesn't need stirring. Does that make sense? (I just made that up - ha!) In other words, it sets some wheels in motion that sometimes trigger needless repetitive phone calls and requests. Rest assured, I will be paying a visit in the next day or two. Meanwhile, if she is content, so am I. I am even working on some blogging not related to my mom, but you know how it is -- the more you have to blog about, the less time you have to blog!!!! Thought I would take a minute to share that my 6th graders, Jacob and Kristin, had Career Day at their middle school this past week. This is where different parents and volunteers share information about their careers with the students. Some of the students get dressed up for school that day (it was actually a half day of school). 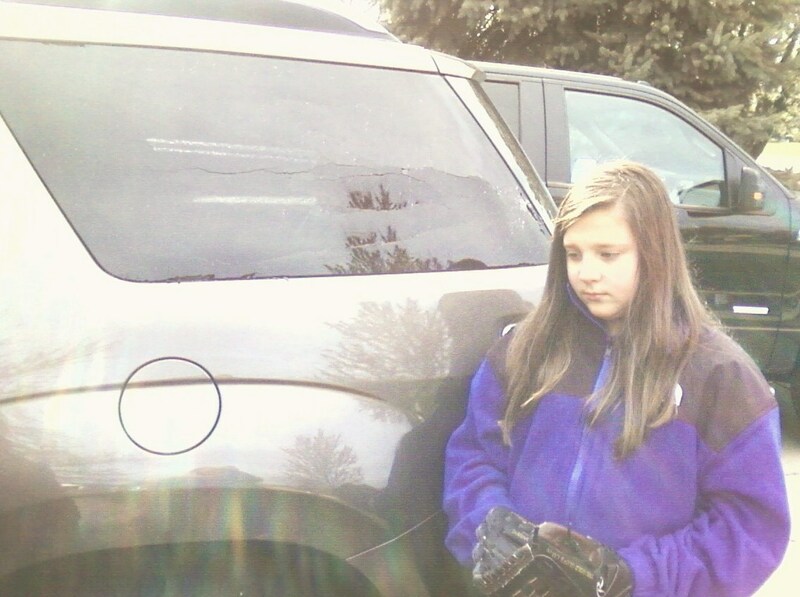 Kristin took this very seriously and acted like she was going on a job interview. The night before she was deciding outfits, trying them on and texting pictures to her friends, laying out clothes and jewelry, and was even afraid she was getting a zit on her face (which I couldn't even see...lol!). Jacob's preparation was...can I just wear a nice golf shirt?? I told him it was fine! Ha! For some reason, I got quite a kick out of this list. I realize that in 6th grade you don't necessarily have a clear focus on your future career, but I found this list fairly diverse to say the least! In the end, Kristin's "favorite" was Makeup Artist and Jacob's was Mechanical Engineer. However, they both are considering dentist and dental hygienist because they were giving out the best "free stuff". Did any of you grow up to be what you wanted in 6th grade? Oh, to be young again!!! Sometimes I miss those school days!! First, I want to say thank you to those of you who follow along with these little stories I share about my mom and me. You leave the nicest comments and they really do help encourage me, keep things in perspective and give me comfort. After last week's unexpected adventures, I put a little distance between my visits to my mom this past week. Me and my family visited her yesterday, on Easter. Interestingly, she never really asked about any Easter plans and seemed content to stay where she was which allowed us more time to spend with our kids. As you may recall, Christmas was another story. One underlying frustration I have is that in addition to taking care of my mom and kids, I am still working on the condo my mom used to live in. May sound easy...pack it up or throw it out. But this is no ordinary place -- it's a bit overwhelming. I have shared some pictures before of her kitchen and living room. My current focus is working on my mom's bedroom. Things have to be gone through with a fine tooth comb because mixed in with trash and crazy things my mom saved are important papers and things like keys, money, and other sentimental items. 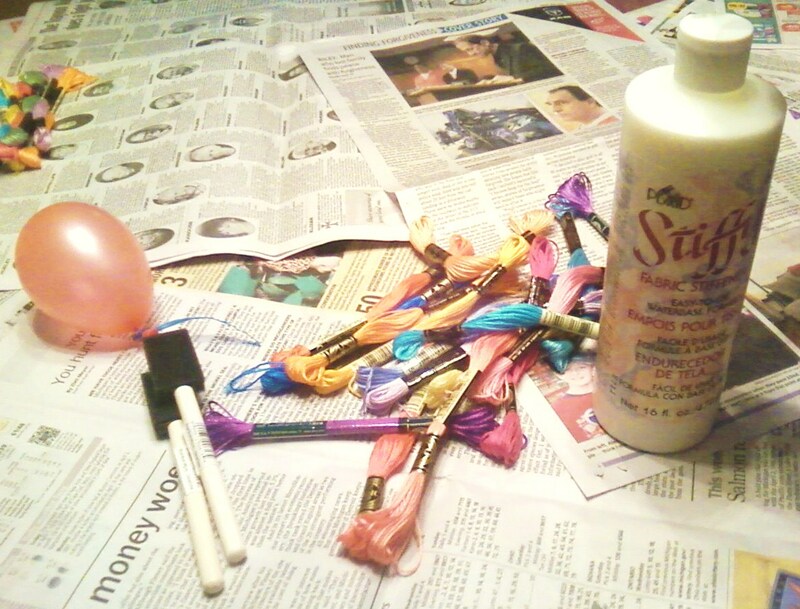 Recently, it took me a couple of hours just to clear and go through my mom's nightstand (see picture below). It's hard to believe this is what the room looks like now without her bed and one of her large dressers in it. You can imagine the clutter before!!? Those piles of bags and things? Those are not my doing. That is how things were. Actually, things were worse. Thankfully, my brother completely emptied her closet several months back and donated all of those clothes. It was probably safe to do that since, as you can see, she could not even get to her closet for years! I do not talk about any of this with my mom as she (obviously) is not comfortable getting rid of anything!!! When going through these things I have to constantly remind myself that this is a disease and that these are only things. I also have to turn off my mom's voice in my head which always says "wait, I need that ........." as I continue to throw things in the trash. The sooner I get through all of this "stuff" and lighten the load the better! Wish me luck!! Easter Blessings from our house to yours!! Me and my girls whipped up these treats today while my husband and son were up north opening up our little summer cottage (yay!). 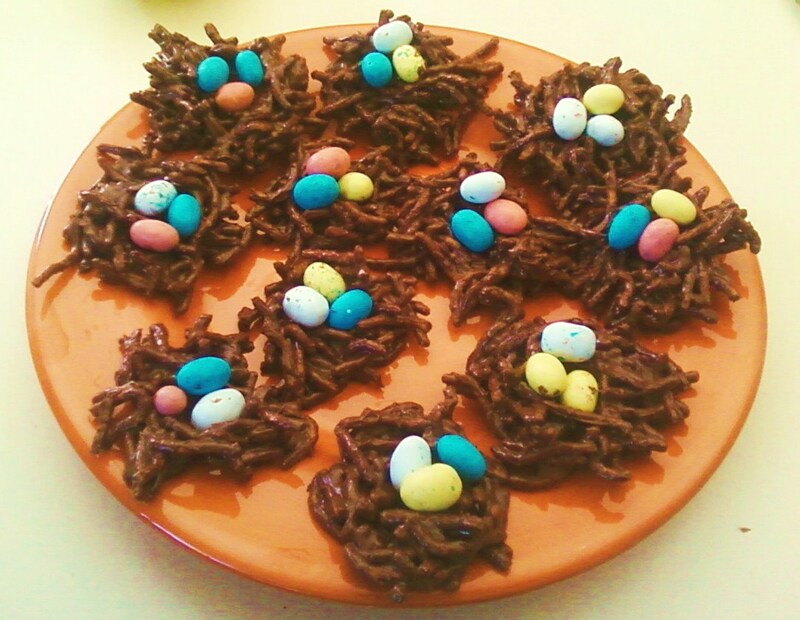 This is a no bake recipe, so it is super easy (and messy)!!! I let the girls take over after I made a few of them. Empty your two bags of chips into a microwave-safe bowl. Melt in the microwave on 50% power for 60 seconds. Stir and repeat until all chips are smoothly melted. Gradually fold in chow mein noodles until covered in chocolate. Now the messy part... Form little nests onto wax paper (which I didn't have so I used foil). 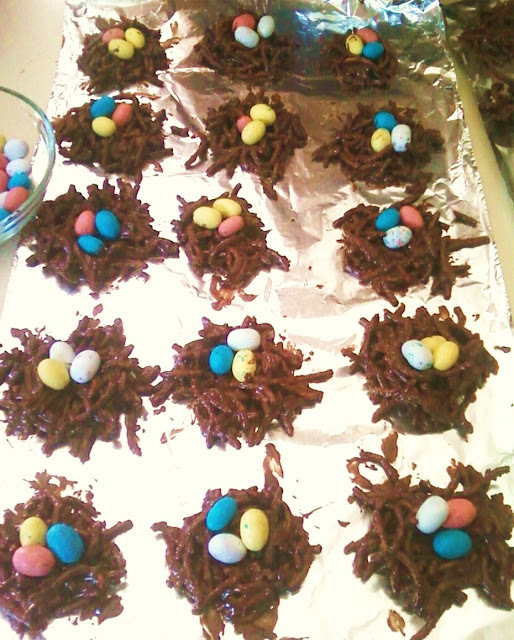 Then place your egg shaped candies in the middle of your "nests". 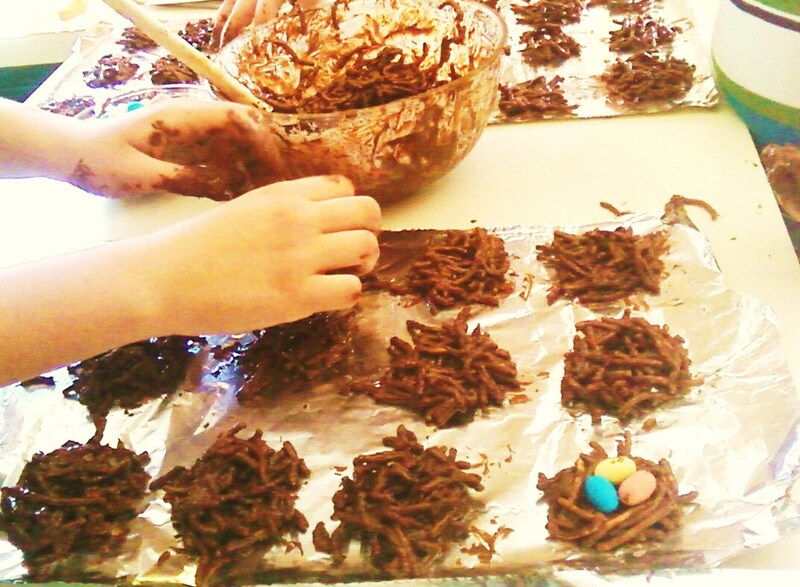 Wait for chocolate to dry and harden or put in refrigerator to accelerate the hardening process. Makes approximately 4 dozen. 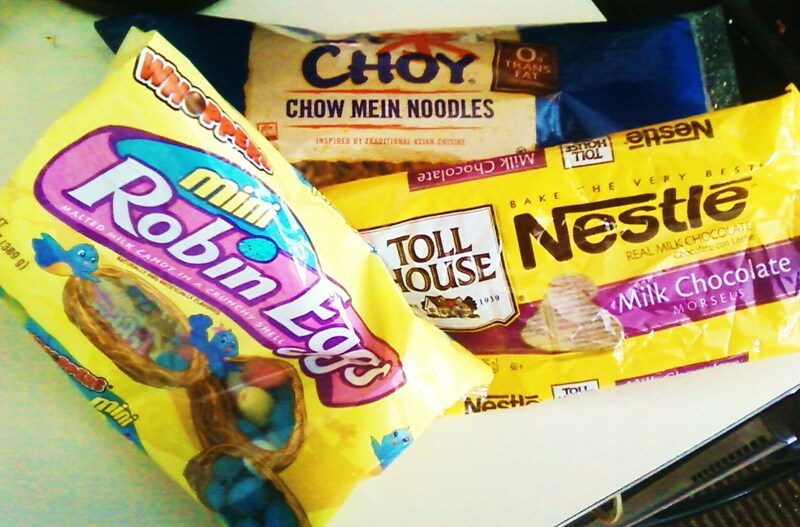 I plan on bringing some of these treats over to my mom's caregivers who are working on Easter -- hope they like them!! So, the kids have been on Spring Break this week and we have been busy busy running around. However, me and my girls took time out recently to try this Pinterest project I had pinned awhile back. 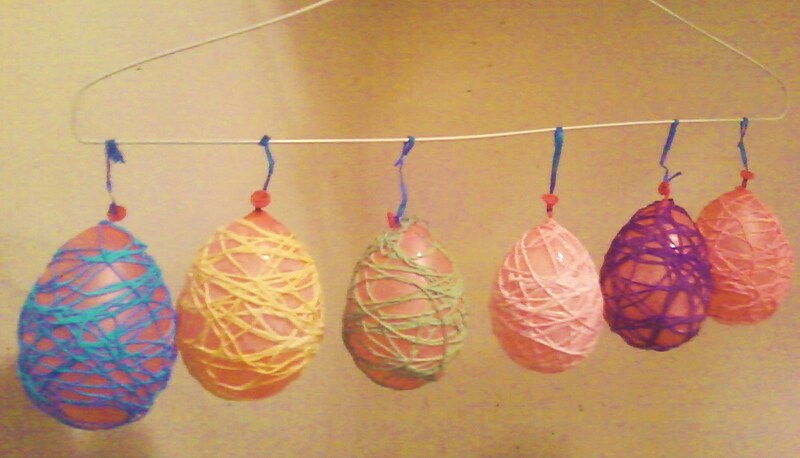 It seemed really neat to me and now that we've made several "eggs" I LOVE them!!! I have never really done anything like this before and I just love the way they turn out...each one unique and whatever colors you want - mix and match! 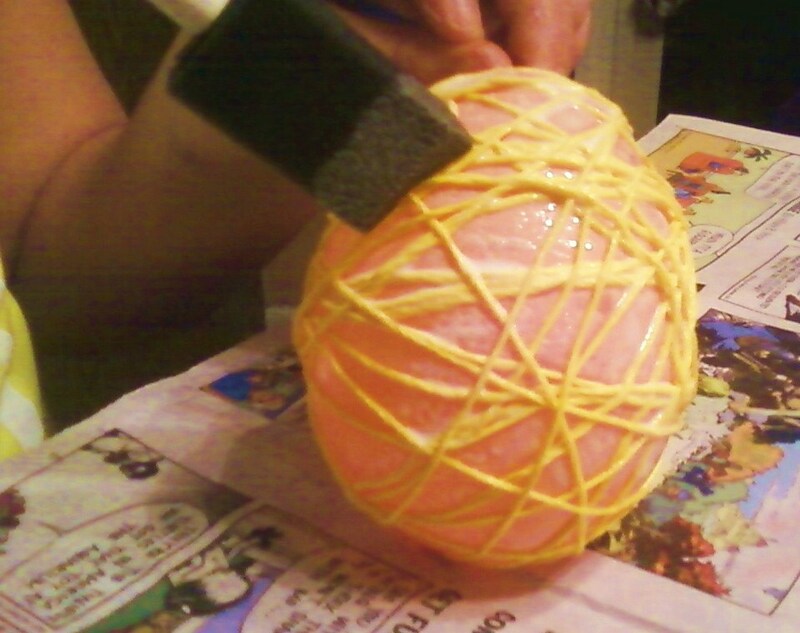 After blowing up and tying several of the smaller water balloons into the size "egg" we wanted, we tied a twist tie to the stem of the balloon. 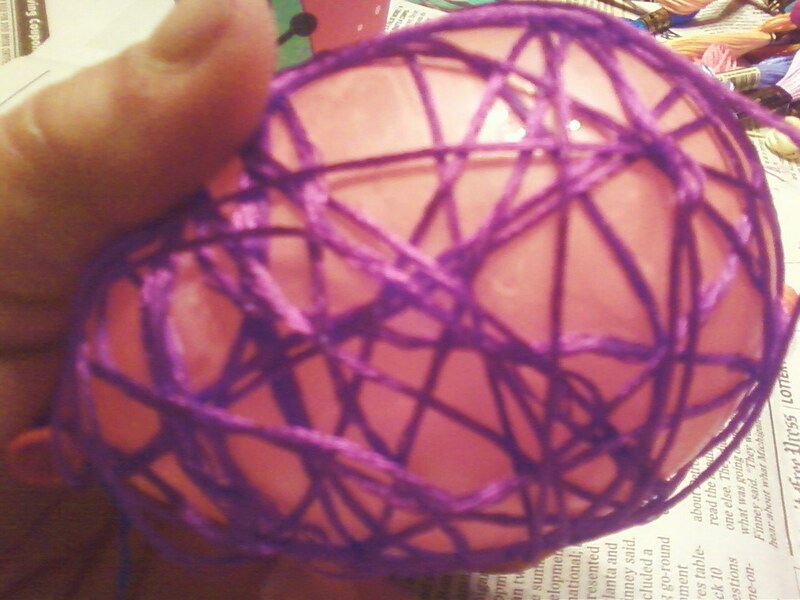 Then, we simply wrapped the thread round and round the balloon every which way and I kinda dabbed the glue on as I went around making sure to cover the "top" and "bottom" part of the egg as well as the sides. 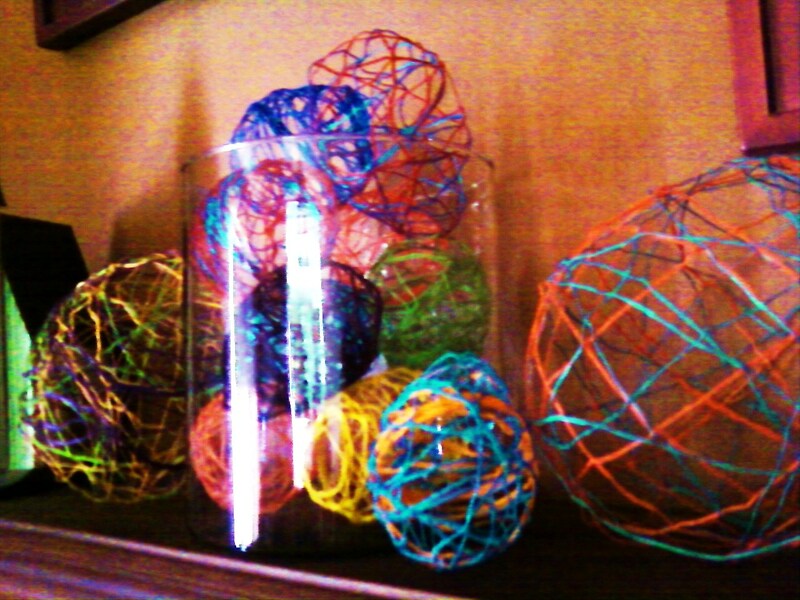 For the small balloons I used one full strand of embroidery thread (.35 cents at craft stores). 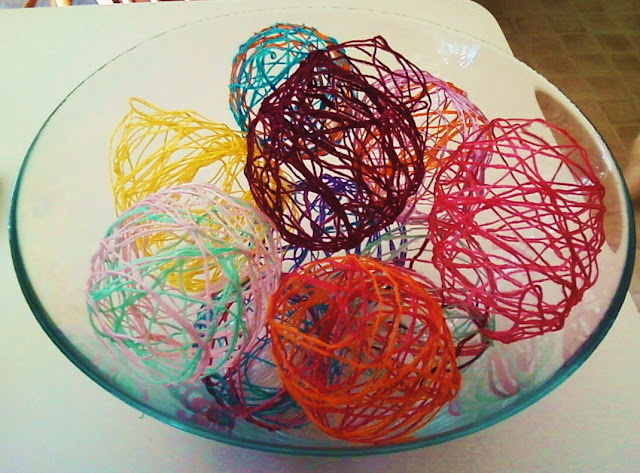 The bigger eggs used 2-3 strands. 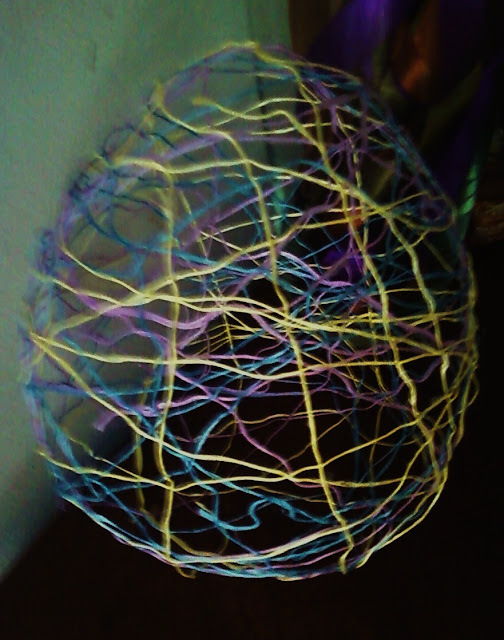 After you cover with the desired amount of string, I dabbed the fabric stiffener really well all around the balloon covering all threads. 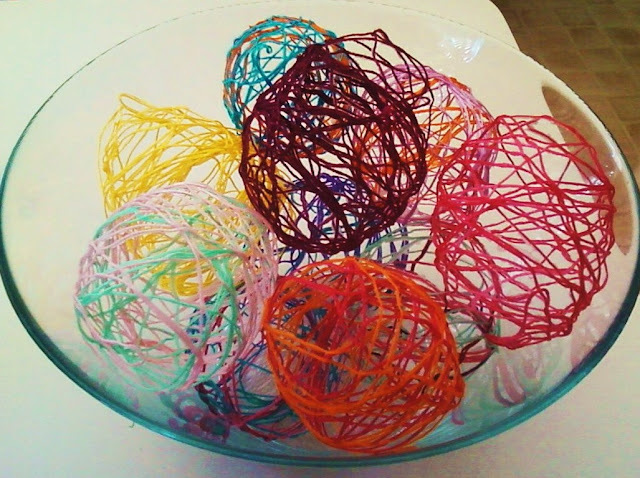 We also made bigger eggs using two or three of the full strands of embroidery thread. These were fun and my girls are planning to make round shaped ones to hang in their rooms. Whatever shape your balloon is, that's what you will end up with. Voila!! We liked it so much, we are mass producing them over here and going to make some more later today!! *I think the Stiffener is basically glue and water and I believe you could try mixing those and get the same affect! I don't even know where to begin. This past week my mom was more agitated than usual. I attribute 50 percent of that being due to her tv "not working". 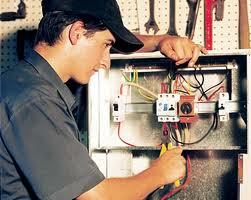 Not working simply means I have to go over there and push one or two buttons and "fix" it. When she doesn't have a tv to watch she does not know what to do with herself when she is in her apartment. "The Don's" daughter also called me at 10 pm one night to tell me my mom was not answering her phone so they had to have the Medical Team go and get their dad from my mom's apartment. Ugh! I can sympathize with her frustration, but was it really necessary to call me late at night to tell me that!? I had just been there earlier in the day to "fix" the tv. I knew I was going back on Friday to take my mom to a dr.'s appointment. Later I realized her phone was probably not working as I was not able to reach her for a day or two. On Friday, I did discover that the "ringer" was turned off on her phone. The good news, I knew she was in a safe place, with a medical alert bracelet and people who check on her on a regular basis for medications, meals and personal care so her not having a phone is not as critical to me as it once was. She was still able to make calls, just not receive them. On Friday morning I found my mom just leaving the dining room from breakfast and talking to "The Don". She had a hat on. An old blue jean hat she sometimes wore in the sun. Immediately I knew this was not good. I asked her why she was wearing a hat. She said because she made a big mistake and cut her bangs way too short. 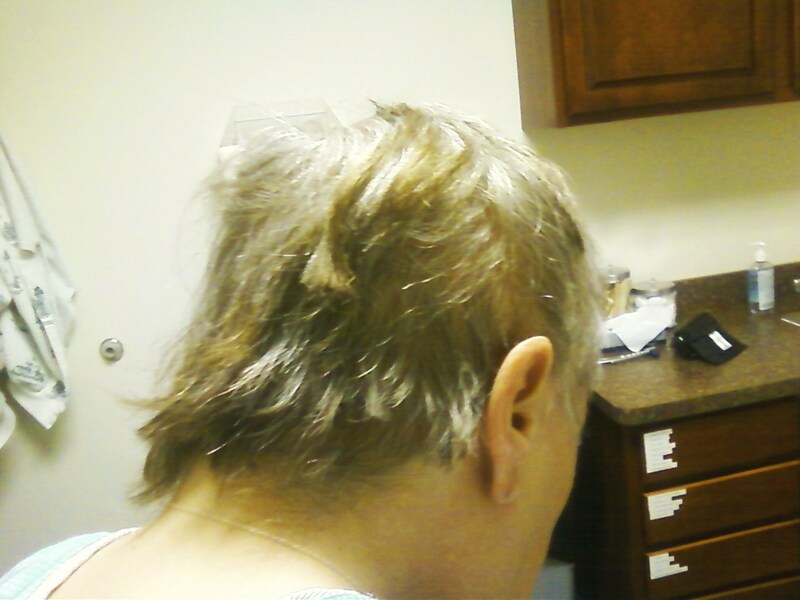 I asked to see her hair....she hesitated...it was not good!! I was shocked! I told her we had a doctor appointment and we headed to the elevator. I could see the other residents shaking their heads at me and my mom. All I could say is, "mom, mom, mom, mom, mom..."
We went to her apartment and gathered her things to go to the doctor. She insisted on wearing the hat, which to me just called more attention to her. Honestly, it made her look like she had no hair. She repeatedly said, I will never do it again. Take my scissors. Did you take my scissors? I will never do it again..... The more I looked at her hair, the more mortified I was. I was planning on getting her hair done before Easter... 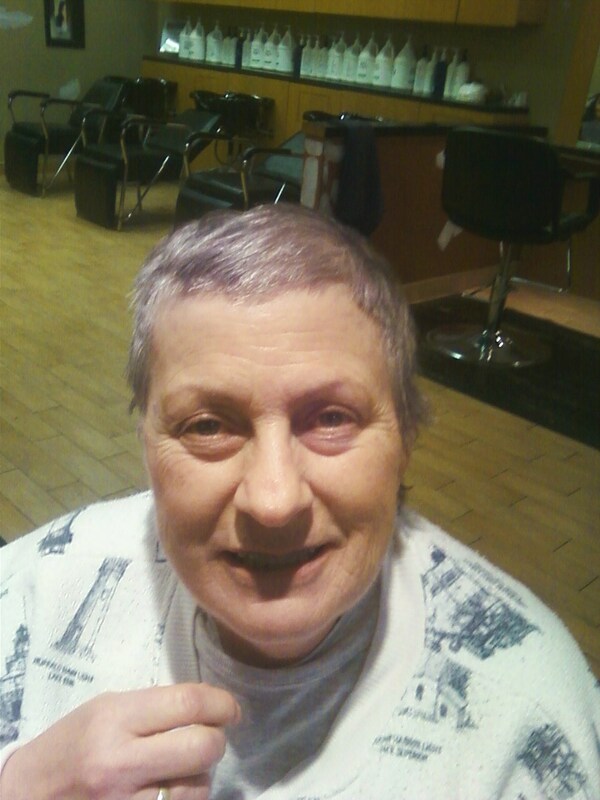 In fact, I had just decided to have the hair salon in her building do her hair for the first time. Not anymore...at least not for awhile. It was hard to focus on the doctor's appointment. It was relatively uneventful. My mom was embarrassed and upset at herself. Her doctor was nice about it. We all tried to make light of it. I knew I had to quickly shift from being appalled to being sympathetic to my mom and getting her confidence back. It wasn't easy. It was the first day in awhile that I lost my patience with my mom. Her repetition, her promises, her questions of where we were going, what color we were going to color her hair, what doctor we were going to, did I take the scissors, more promises that she can't even keep if she wanted to... My mom looked like she had, without warning, gone to chemotherapy and lost much of her hair. I was not prepared for it. I have already lost my mom on a personal emotional level, but this caught me off guard. It is a scary disease. There is no rhyme or reason. Nothing is predictable. It made me very sad for her (and for me). I was hoping to have a nice visit or another lunch after her appointment. Instead, we were sidetracked... Once we got back to her apartment, I took decided to take the hat and would not let her wear it. I didn't want her to "hide" under a hat for a month. It was hard to do, but I felt it was best. She was upset and wanted the hat, but I told her she looked fine and that it is a nice summer style (ha!). I put some makeup on her to make her feel better. I checked on her several times on Friday, Saturday and Sunday by telephone. I was afraid she would hide in her apartment. I made sure she went to dinner. I made sure she went to breakfast, and I called and reminded her to go listen to the piano player in the lobby on Saturday. I have talked to her six times since Friday. She has not once mentioned her hair..... For that, I am grateful!!! I was and am afraid it could make her lose her confidence and retreat to her apartment. So far, so good. It appears she may have forgotten the whole thing and moved on...I wish I could do the same!! Well, her hair isn't grey anymore!? ?